I intended to make the dish last night with a leafy green salad, but instead spent the night scrubbing our kitchen and storing all counter items in plastic tubs in preparation for the exterminator. Woo hoo! Instead of cooking, we ordered from Taqueria Los Jalapenos, which has–hands down–the best burritos in the area. We order from “Three Jalapenos” (that’s our nickname for the spot due to their website) a couple of times per month. With a stale baguette and five ripe tomatoes in hand, I knew that tonight would be my make or break night for the Scalloped Tomatoes. Something you will come to learn about me is that I have difficulty following directions. Whether it’s Ikea furniture (to my husband’s dismay,) speed limits or recipes, I always tend to find my own, shall we say, adaptation. This is one of the reasons that I have struggled with the concept of blogging my cooking. I will *almost* never be able to share an accurate recipe with my readers. You have been forewarned. What follows is the recipe that I used as an outline. I will do my best to share my minor personalization of the dish as we go along. Preheat the oven to 350°F. Heat olive oil in a large sauté pan over medium-high. Add the bread cubes and stir so that they are evenly coated with oil. 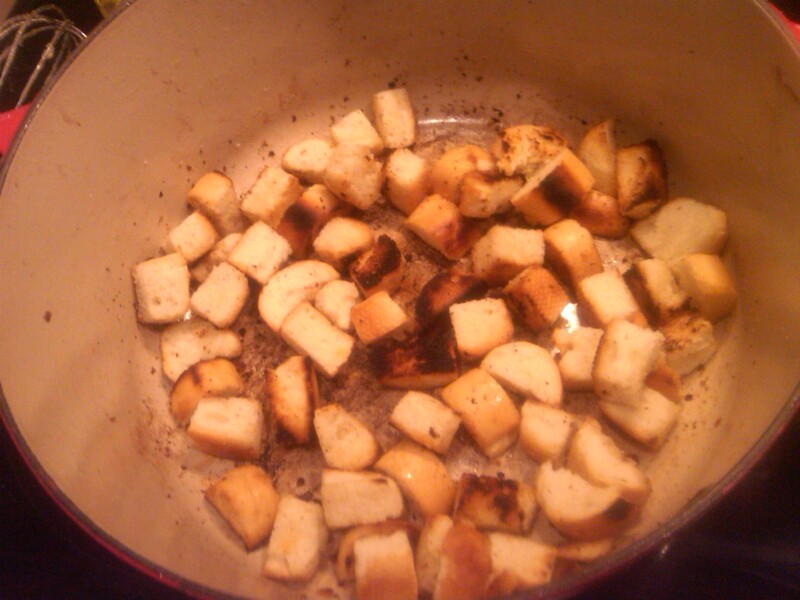 Cook cubes, tossing frequently, until toasty on all sides, about 5 minutes. Meanwhile, combine tomatoes, garlic, sugar, salt and pepper in a large bowl. 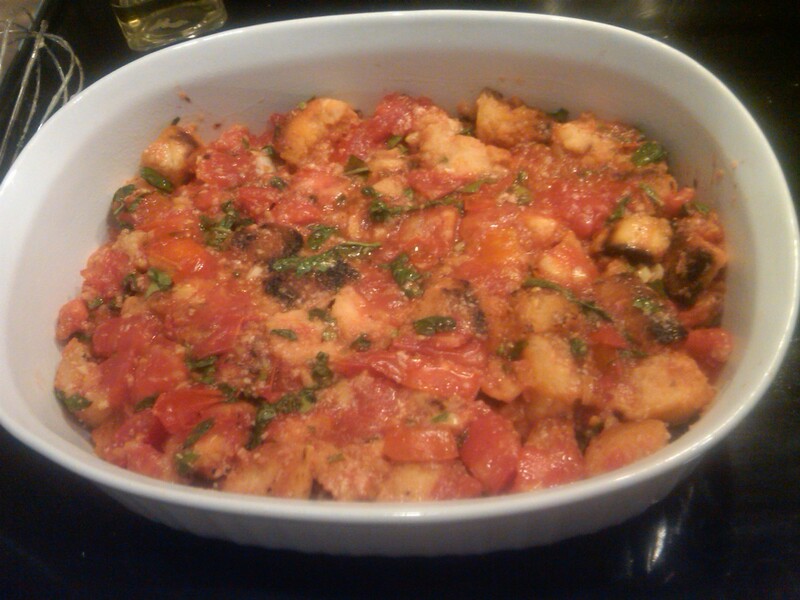 When the bread cubes are toasted, add the tomato mixture and cook them together, stirring frequently, for 5 minutes. 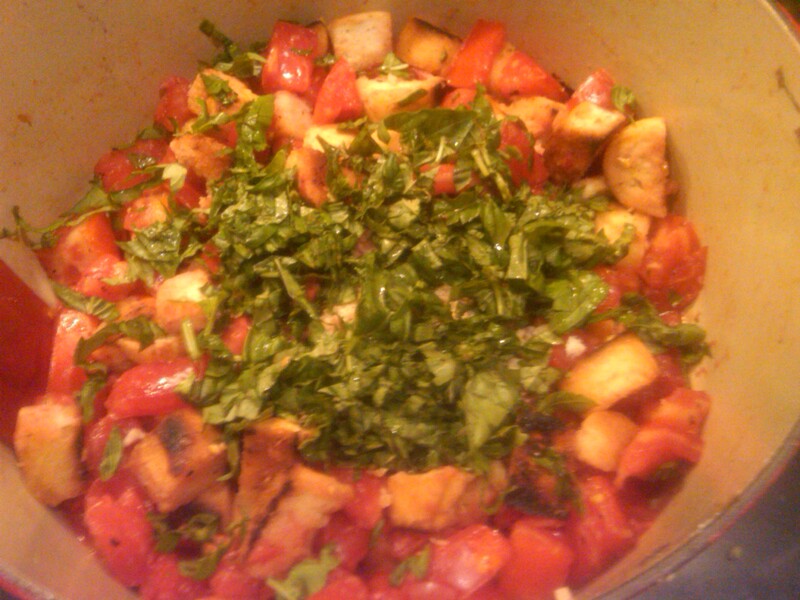 Remove from heat, and stir in the basil. Fresh basil on top of this tomatoey goodness? Yes, please! This deserves its own photo. 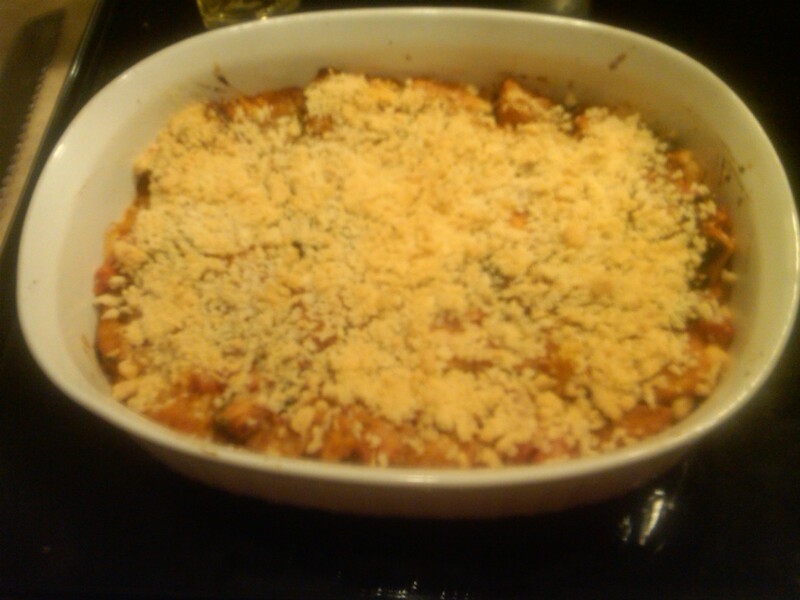 Pour into a shallow (6 to 8 cup) baking dish and top with Parmesan cheese. I mixed some of the parm into the dish (probably about 2 tbsp) and topped it with panko as well. Why? Because that’s how I roll. This picture is pre-parm and panko crusted. 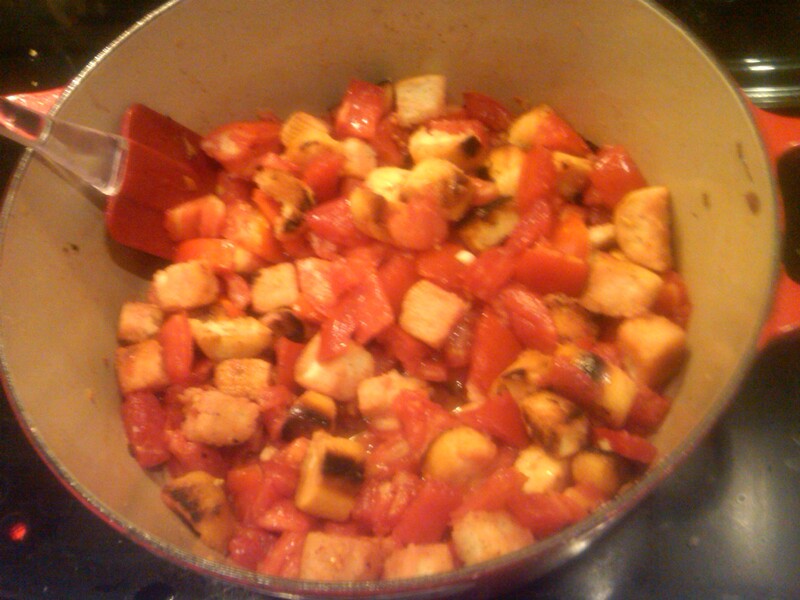 Bake 35 to 40 minutes until the top is browned and the tomatoes are bubbly. It should look a little something like this. If you’re so inclined, eat it with some fresh (stored moist and in the fridge) corn and a leafy green salad. But only if you’re so inclined. Smitten Kitchen also suggests topping it with a poached egg for brunch. Too bad I won’t get a chance to do that. Maybe next time. This dish was well received by all (my husband and myself, that is.) We enjoyed the opportunity to try summer’s bounty in a new and unique iteration. 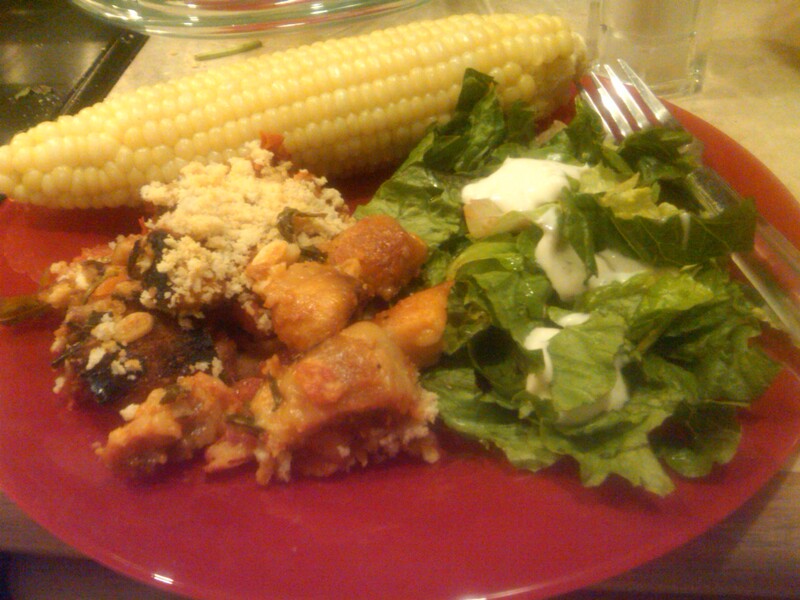 I especially loved crunch that remained on some of the croutons while others got a little soggier with tomato yumminess. The basil also imparted yet another reminder of summer. I was too lazy to snip herbs from out front (basil is kept out back, the rest are out front. Don’t ask.) but would probably add some fresh oregano and thyme next time around. Or maybe not–if it ain’t broke, don’t fix it. Overall, scalloped tomatoes receive an enthusiastic 2 thumbs up! This is an engagingly written, attractive and interesting blog. May you attract many healthy followers. Notwithstanding your fears I think your writing is a credit to your respect for the language. This is professional and well written Zoe! Love the blog! Keep it going!